Rona Rubin of Pfizer Global Pharmaceuticals at recent Sy Syms School of Business event discussing the challenges, and rewards, of balancing family, religious, and professional lives. 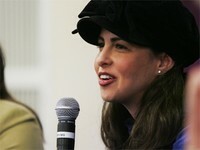 Apr 4, 2006 — Orthodox women today are pushing their way into business and succeeding –– despite the challenges –– said five women who came to a Sy Syms School of Business presentation at the Beren Campus in March. The women, representing fashion, accounting, human resources, pharmaceuticals, and advertising, shared their message with more than 100 student and staff representatives from Ma’ayanot Yeshiva High School in Teaneck, NJ; Stella K. Abraham High School for Girls in Hewlett Bay Park, NY; SAR High School in Riverdale, NY; Hebrew Academy of Nassau County; North Shore Hebrew Academy High School in Great Neck, NY; and Yeshiva University High School for Girls in Queens, NY. Although they are all in different sectors of the business world, Janet Riesel of Ernst & Young, Rona Rubin of Pfizer Global Pharmaceuticals, Sarah Klayn of Deloitte & Touche, Rachael Weber of Liz Claiborne, and Suzy Schwartz of BBDO agreed that juggling religious, family, and business life can be difficult, but also extremely rewarding. Sarah Klayn, a graduate of Sy Syms School of Business, said she chose a career in accounting because she wanted a large enough income to handle yeshiva tuition, yet also a flexible field which could afford time to spend with family as well. But some of the other presenters said they fell into business careers or started out in one business field but found another to be more accommodating to their religious and family choices. All of the participants said that their colleagues respected and even appreciated their religious convictions. They discussed how traveling was rarely a problem because kosher food is available everywhere and co-workers can understand religious convictions if they are explained. “We are in a generation that respects diversity,” said Ms. Riesel, a graduate of YU High School for Girls. Suzy Schwartz, the keynote speaker at the event, observed that many people in the business world don’t know a lot about Judaism. “You will have to be doing a lot of educating,” Mrs. Schwartz said. The women spoke about the need to be flexible. While many large companies today have programs to retain career women, each of the women talked about putting in her time at the beginning and paying her dues. Ms. Rubin, a graduate of Sy Syms School of Business, started out in consulting, but found the travel and time commitment to be incompatible with raising a family. “It is up to you to create the flexibility for yourself,” she said. I just want to mention I am just beginner to weblog and truly savored you’re web blog. More than likely I’m likely to bookmark your website . You certainly have really good writings. Bless you for revealing your website page. I simply want to mention I’m very new to blogging and site-building and actually loved this blog site. Probably I’m going to bookmark your website . You absolutely have fabulous articles. Appreciate it for sharing with us your blog. I just want to mention I am beginner to blogging and actually loved your web page. Probably I’m going to bookmark your website . You definitely have superb stories. Thanks a lot for revealing your blog. I simply want to tell you that I’m very new to weblog and honestly enjoyed your web blog. Very likely I’m want to bookmark your blog . You absolutely come with perfect stories. Thanks a bunch for sharing your website page. I just want to mention I am very new to blogging and site-building and really enjoyed you’re web-site. Likely I’m going to bookmark your site . You really come with beneficial well written articles. Kudos for revealing your web-site. I just want to say I’m new to weblog and actually savored this web page. Almost certainly I’m want to bookmark your blog post . You certainly have impressive article content. Appreciate it for sharing with us your web page. I just want to mention I am just new to blogs and really savored your web site. Probably I’m planning to bookmark your blog post . You amazingly come with beneficial article content. Thank you for sharing with us your web site.